The dependability and durability are probably the major selling points of Toyota’s trucks. 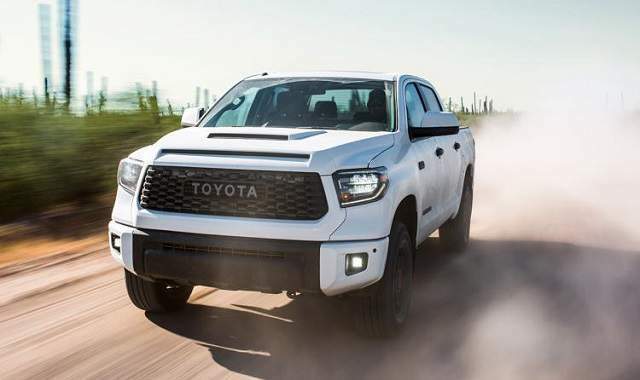 However, the full-size Toyota Tundra struggles to stay competitive with other full-size models and it will be even harder with the arrival of the all-new Ram 1500 and GM’s light-duty trucks. The Tundra has, however, its distinct qualities such as strong V8 engines, comfortable rear seat, the standard suite of active safety features, etc. However, since redesigned models including the Ford-150 offers diesel engines and bigger cabins plus modern tech and safety features Toyota will have to do better in the near future. The 2019 Toyota Tundra will do some things better, but since it was refreshed for the 2018 model year significant structural upgrades will be on the shelf in years to come. What fans of more traditional trucks will like is the upgraded TRD Pro trim while Toyota hasn’t revealed details about the rest of the lineup. We don’t expect big upgrades for other trim versions, however, a new diesel engine could significantly benefit this Toyota’s half-ton pickup truck. 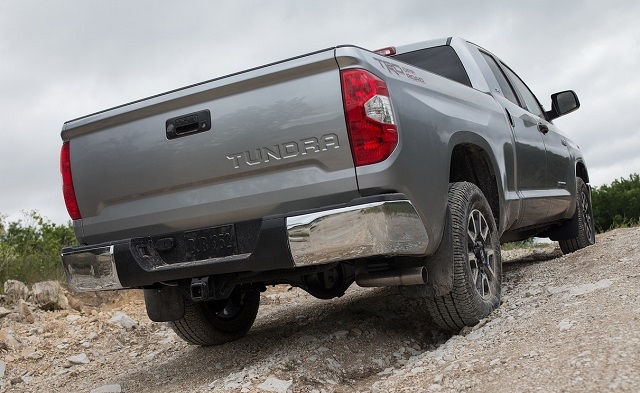 The Tundra isn’t the prettiest truck on the road but its look telegraphs model’s great capability and dependability. The massive trapezoidal grille can’t be miss-detected for something else even from great distance. The grille comes with different executions depending on the trim level and the upgraded TRD Pro version has a black finished version with TOYOTA lettering. The TRD Pro version also comes with LED headlights and LED taillights. This off-road focused version also has more black accents and the pair of black chrome exhaust tips. The new hood scoop also adds to the appearance of this model while for the serious off-roading the model also exploits all-terrain tires wrapped around the 18-inch forged-aluminum, five-spoke wheels. The model also includes the front skid plate. The interior of the 2019 Toyota Tundra won’t change much but the TRD Pro will add unique logos on the seats, armrests, floor mats and red stitching. The center console and shift knob will also be the TRD Pro-branded. The dash design will, however, stay unchanged with the symmetrical design and well-arranged controls. The models will also have Toyota’s latest infotainment system and standard Toyota Safety Sense package. This package includes systems such as adaptive cruise control, lane departure warning, automatic high beams, forward collision warning, and automatic emergency braking. The Tundra will also offer premium features like the leather upholstery, heated and ventilated seats, premium JBL sound system, a sunroof, etc. The 2019 Toyota Tundra will continue to use two strong but thirsty V8s. The base engine remains 4.3-liter V-8. It can produce 310 horsepower and torque of 327 pound-feet. The optional engine is again a 5.7-liter V-8 and this engine is under the hood of the TRD Pro version by default. This engine makes 381 hp and 401 lb-ft of torque. Both engines come with the six-speed automatic transmission. If Toyota decides to follow Nissan’s example, it is realistic to see Turbo Diesel Cummins engine under Tundra’s bonnet very soon. This 5.0-liter V8, 32-valve turbo diesel engine with its 310 horsepower and 555 lb-ft of torque does well for the new Nissan’s Titan XD, and made it one of the most popular and most capable truck in class. Matched with Toyota’s technology and advanced gearbox this mill could set new Tundra Diesel neck to neck with the toughest trucks in the full-size segment. The Tundra can be had with the two- or all-wheel drive and upgrades which improves its off-road abilities. The new TRD Pro version exploits suspension with 2 inches of additional lift. The model also has the Fox Shocks. The front wheel travel also has additional 1.5 inches. But the rear wheels travel has the increase of 2.0 inches. The 2019 Toyota Tundra will hit the market by the end of the year. The price range will stay close to the current. What is the towing capacity of 2019 pick- up? Maximum towing for Toyota ?